Figure 1. Bearish Engulfing pattern. This article is devoted to the Bearish Engulfing two-line pattern. The Japanese name of the Bearish Engulfing pattern is tsutsumi, what stands for the Japanese art of packaging and derives from the verb whose meaning is to envelop (a present). In English, we use the word engulfing because the second line engulfs (overlaps) the first line of the pattern. The Bearish Engulfing is a two-line pattern which the white candle's body of the first line is engulfed by the black candle's body of the second line. The first line can be any white basic candle, appearing both as a long or a short line. It can be even a doji candle, except the Four-Price Doji. The second line is any black candle appearing as a long line: Black Candle, Long Black Candle, Black Marubozu, Opening Black Marubozu, Closing Black Marubozu. Pattern appears in an uptrend and forecasts its reversal. If the trading volume grows on the second line, the pattern reliability is higher. 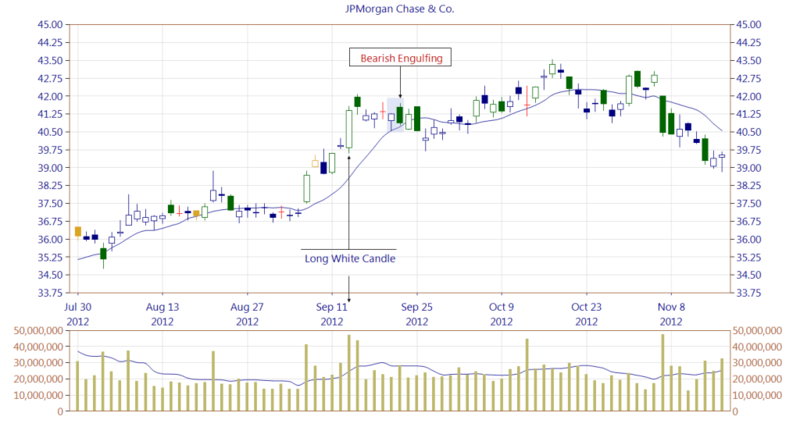 The Bearish Engulfing pattern needs confirmation on the subsequent candles. Morris created the Three Outside Down pattern as a confirmation of the Bearish Engulfing. In general every pattern is recommended to be confirmed. Confirmation can be in the form of breaking the nearest support zone or a trendline. It is crucial where on the chart a Bearish Engulfing appears. Depending on the market context, the candle pattern may be only a short break before further market increases. Especially if below a Bearish Engulfing a strong support area exists. 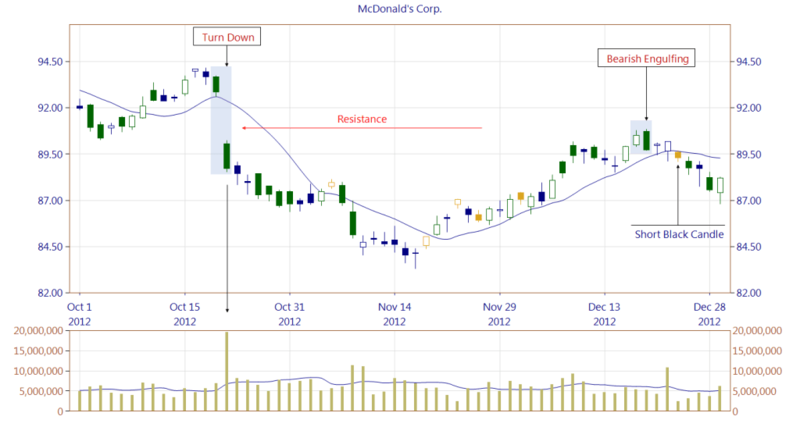 If a Bearish Engulfing pattern is confirmed, its second line may form a resistance zone. Figure 2. The occurrence of a Bearish Engulfing being an example of how the market context is critical. Before the appearance of a Bearish Engulfing pattern, we can see a Turn Down occurrence forming a very strong resistance zone. Although it was created two months prior the Bearish Engulfing, it stopped the market increase. Short Black Candle, which closing price is below the trendline and appearing after the pattern occurrence, confirms its bearish forecast. Figure 3. The figure presents how the Long White Candle, formed at a high trading volume, makes a very strong support zone. Appearance of the Bearish Engulfing has to be confirmed what is not that easy. First, the trendline has to be broken. Second, the Long White Candle has to be entirely covered, to cancel the support zone. As we can see, the Bearish Engulfing patterns was not confirmed, after all. 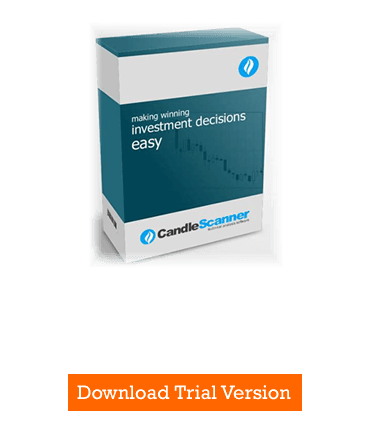 Below you can find some Bearish Engulfing pattern statistics calculated by CandleScanner software. To see more detailed statistics, for other markets and periodicity try our CandleScanner software. Prices start at only $10, and you can see more detailed statistics, for other markets and periodicity. Click here to find out more!